New initiative to remind the Camino de Santiago not only be done on foot or by bicycle, can also be part of the way by sea. And they are increasingly pilgrims who dare to make some stage, or their approach to the Spanish coasts, through a sailing boat and arriving in the Bay of Biscay. This is also what you are trying to promote the 'Sail The Way' initiative, organized by the association of private marinas northern Spain. some even claim to have reached the 80 boats between 12 and 14 meters long - According to the organizers, the initiative, currently under development, more than 40 sailing boats participate. 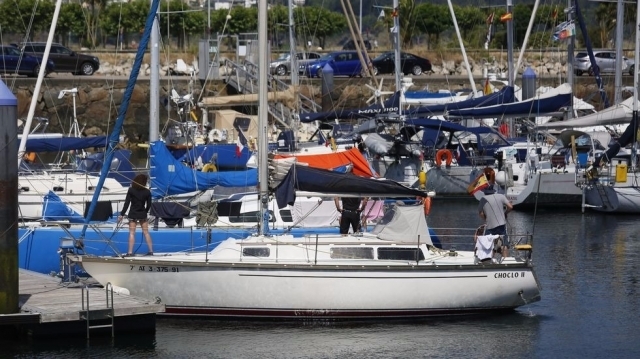 The pilgrims who are participating in 'Sail The Way' set off from Hondarribia on Monday 18 July. They aim to reach Santiago de Compostela next Wednesday 27, after completing the last leg by bus from the port of La Coruna, covering the last 10 kilometers on foot. They will be a total of 7 races that covered 360 nautical miles, about 670 km. Currently in Viveiro, coming in yesterday from Gijon in the only nocturnal leg of the trip, including to give more excitement to the adventure. No es que sea demasiado fan de hacer el Camino en un Velero, ya que prefiero caminar y ver monumentos, etc Pero sin duda sí parece interesante hacer, aunque sea, una etapa así.